Your browser version is unsupported and can cause issues while using Savas LD. Please consider upgrading your browser or downloading Google Chrome or Mozilla Firefox. Welcome to Savas LD self-service portal for Lietuvos draudimas customers. Logging in to Savas LD for the first time? Get help! Follow these directions and you will immediately access your Lietuvos draudimas insurance data. Register with customer code, password and security code sent by SMS. Enter your customer code (Draudėjo kodas). Connecting for the first time, your user name is your customer code in Lietuvos draudimas. You can find it in the policy document, as "Draudėjo kodas", by calling our help line 1828 or by contacting your insurance agent at Lietuvos draudimas. Enter the password. Connecting for the first time, your password will consist of uppercase letters LD and 6 last numbers of your personal ID number, e.g. LD121234. After you click CONTINUE, we will send a one-time security code to your mobile telephone number. When you receive the SMS, enter code into the field and click CONTINUE once again. NOTE: If you do not get the SMS with the security code, please check the telephone number, to which the SMS was sent. You can see the code over the field "SMS code". If the last four numbers are different from your mobile telephone number, please contact as by phone 1828. Electronic banking users can register to Savas LD via bank, which is very convenient. No new user names or passwords to remember! Choose your bank by clicking on the bank logo. When the connection window opens, connect to you bank with the electronic banking login. Confirm permission to use your data for personal identification and you will enter Savas LD site. IMPORTANT: Electronic banking is only used for personal identification. Your financial data will not be checked, and no payments will be made. With a mobile e-signature, your connection to Savas LD site will be safe and reliable. Click MOBILE E-SIGNATURE on the right side of the table. Enter the customer code. Connecting for the first time, your user name is your customer code in Lietuvos draudimas. You can find it in the policy document, as "Draudėjo kodas", by calling our help line 1828 or by contacting your insurance agent at Lietuvos draudimas. Enter the telephone number as 86XXXXXX. IMPORTANT: If you want to connect using mobile e-signature, you need a contract for this service with your mobile operator. Upon clicking CONTINUE you will see the control code on your computer screen. The control code will be sent to the mobile telephone number specified above. Confirm the received code in your mobile telephone and immediately access Savas LD site. After you connect to Savas LD, we will kindly ask to check your contact information. . Please review your e-mail address. If it is missing of incorrect, enter the right address and we will send you an e-mail with a confirmation link. Click on it and confirm updated information. IMPORTANT: After the e-mail address has been updated successfully, you can use it as a user name when connecting to Savas LD. Easy - no customer code to remember! Read them carefully and confirm them by ticking "I have read the rules" and clicking the button CONFIRM. Existing user of Savas LD? Connect! Connect with your user name, password and security code received by SMS. Enter your login – your email address, telephone number, client's (policy holder's) code or a unique username. Please enter email address, specified by you during the first connection and confirmed by clicking on received link. You can find your customer code in the policy document, as "Draudėjo kodas", by calling our help line 1828 or by contacting your insurance agent at Lietuvos draudimas. If you did not change your password, it consists of uppercase letters LD and 6 last numbers of your personal ID number, e.g. LD121234. If your password was changed, please note that it consists of at least 8 symbols and is made up of digits and letters. NOTE: Click "Forgot your password?" to get password reminder. Enter your user name and text from the security picture, click GET A PASSWORD and we will send a temporary password to e-mail specified by you during the first connection. Upon clicking GET SMS CODE, we will send a one-time security code to your mobile telephone number. When you get the code, enter it into the field and click CONTINUE again. Click ELECTRONIC BANKING on the top of the table. Click MOBILE E-SIGNATURE on the top right of the table. User name is your e-mail address or customer code. Please enter email address, specified by you during the first connection and confirmed by clicking on received link. IMPORTANT: In order to connect with the mobile e-signature, you need a contract for this service with your mobile operator. 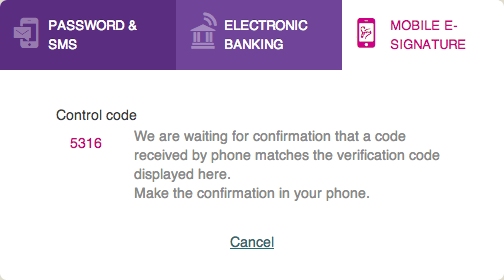 After clicking CONNECT, you will see the control code, which will be sent to the mobile number specified by you. Confirm the received code in your mobile telephone, and immediately access Savas LD site. Only existing clients of Lietuvos draudimas can use Savas LD. If you have problems logging in to your Savas LD account, please call us at 1828 or contact your insurance agent at Lietuvos draudimas.